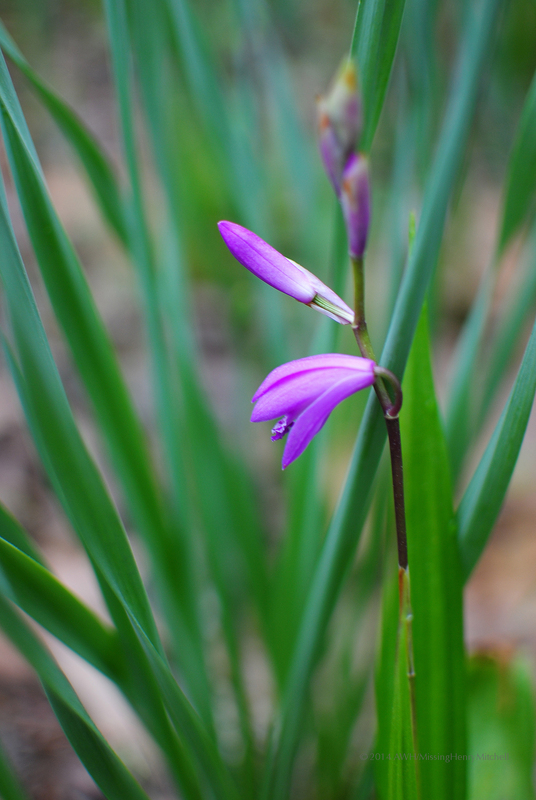 Some years ago I encountered at a garden center a 4-inch pot of Bletilla striata, or hardy ground orchid, in bloom. I don’t require much persuasion when it comes to purchasing delicate looking flowers at inexpensive prices, so home it came. I found an ideal spot for it at the front of a border where it got morning sun and adequate water (not, for once, at the root of an oak). I planted in a well-dug and spacious hole mixed with compost. I mulched with compost, watered faithfully, and waited. It sent up leaves regularly, but didn’t flower. I moved it two years ago to a site I thought would be more appealing, with slightly more sun. Leaves aplenty, but never a sign of a raceme emerging. Finally, five years later, a bloom. Like many orchids, it offers multiple blooms on a slim raceme. The throat of the blossom has tiny ruffles peppered with deep red-violet freckles. The petals fade from dark violet through mauve to white, looking a bit like they were painted with watercolors. 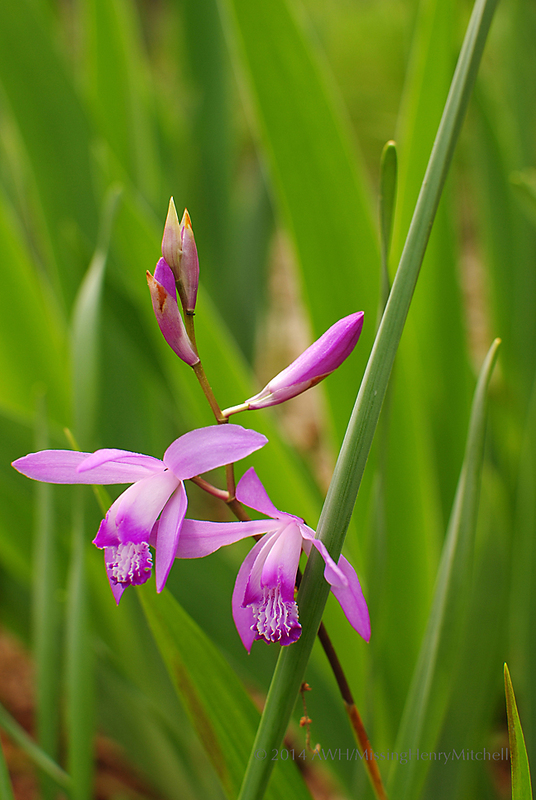 Bletillas are acknowledged in the horticultural trade as being the easiest orchid to grow. That is probably true; I don’t give it any care beyond spreading compost or leaf-mold mulch annually in the bed where it resides and it has survived in spite of me. Perhaps if I fed it a bit, it might produce more flowers. One trick to their care is to transplant meticulously, avoiding damage to the roots. Their pseudobulbs should lie just at the soil’s surface. Beyond that, they are reputed to be fairly adaptable to a variety of garden environments and soils in USDA Zones 6 to 9 (Zone 5 with a heavy winter mulch), though they prefer dappled shade or morning sun and well-draining soil. 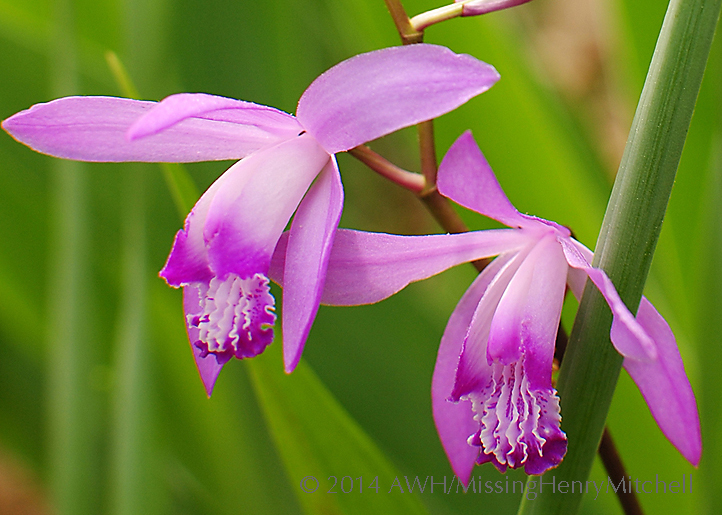 This entry was posted in 2014, Backyard Blooms, Garden log and tagged bletilla, easy orchids, gardening, hardy orchids, nature by missinghenrymitchell. Bookmark the permalink. It is a lovely thing and it is a plant that I have loved and lost, so well done , you are obviously getting it right. It is beautiful and so delicate.